Georg Christian, Count of East Friesland (Graaf van Oost-Friesland), 1660-65, was born 6 February 1634, the son of Ulrich II and Juliane von Hessen-Darmstadt. He succeeded his brother Enno Ludwig in 1660. Georg Christian granted the Mennonites a letter of protection 2 June 1660, upon payment of 1,000 talers and a so-called gift of 100 ducats to his wife, Christine Charlotte, a princess of Württemberg. The Uckowallists, who had on 29 May requested a letter of protection like that granted by Enno Ludwig, received it on June 26 upon payment of 500 talers. New extortions followed. During the brief reign of the prince the Mennonites were fined 1,200 talers for performing a baptism, which they felt they were entitled to do on the basis of the letter of protection. Georg Christian died 6 June 1665 before the birth of his son Christian Eberhard (1665-1708), and was succeeded by his wife, Christine Charlotte (1645-1699), who ruled from 1665 until 1690 when their son began his reign. His wife followed the pattern Georg Christian had set in regard to the Mennonites. Hege, Christian and Christian Neff. Mennonitisches Lexikon, 4 vols. Frankfurt & Weierhof: Hege; Karlsruhe: Schneider, 1913-1967: v. II, 72. Neff, Christian and Richard D. Thiessen. "Georg Christian, Count of East Friesland (1634-1665)." Global Anabaptist Mennonite Encyclopedia Online. April 2007. Web. 26 Apr 2019. http://gameo.org/index.php?title=Georg_Christian,_Count_of_East_Friesland_(1634-1665)&oldid=145228. Neff, Christian and Richard D. Thiessen. (April 2007). 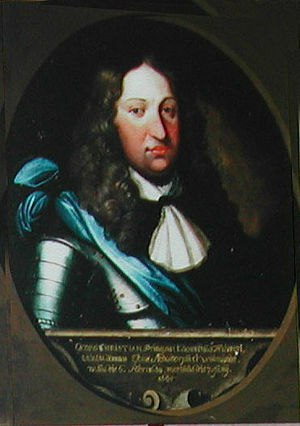 Georg Christian, Count of East Friesland (1634-1665). Global Anabaptist Mennonite Encyclopedia Online. Retrieved 26 April 2019, from http://gameo.org/index.php?title=Georg_Christian,_Count_of_East_Friesland_(1634-1665)&oldid=145228. Adapted by permission of Herald Press, Harrisonburg, Virginia, from Mennonite Encyclopedia, Vol. 2, p. 476. All rights reserved.